STANDARD TIME established on this date. Until 1883 United States railroads each chose their own time standards. The Pennsylvania Railroad used the “Allegheny Time” system that was an astronomical time keeping service developed by Samuel Langley at the Western University of Pennsylvania’s Allegheny Observatory in Pittsburgh. Instituted in 1869, the Allegheny Observatory’s service is believed to have been the first regular and systematic system of time distribution to railroads and cities as well as the origin of the modern standard time system. By 1870, the Allegheny Time service extended over 2,500 miles with 300 telegraph offices receiving time signals. However, almost all railroads out of New York ran on New York time, and railroads west from Chicago mostly used Chicago time, but between Chicago and Pittsburgh/Buffalo the norm was Columbus time, even on railroads that didn’t run through Columbus. The Santa Fe used Jefferson City (Missouri) time all the way to its west end at Deming, New Mexico, as did the east-west lines across Texas; Central Pacific and Southern Pacific used San Francisco time all the way to El Paso. The Northern Pacific had seven time zones between St Paul and the 1883 west end of the railroad at Wallula Jct, but Union Pacific had two between Omaha and Ogden. In 1870 Charles F. Dowd had proposed four time zones based on the meridian through Washington D.C. for North American railroads. In 1872, he recommended the Greenwich meridian. Sandford Fleming, a Canadian, proposed worldwide Standard Time at a meeting of the Royal Canadian Institute on February 8, 1879. Cleveland Abbe advocated standard time to better coordinate international weather observations and resultant weather forecasts, which had been coordinated using local solar time. He recommended four time zones across the contiguous United States, based on Greenwich Mean Time, in 1879. The General Time Convention (renamed the American Railway Association in 1891), an organization of American railroads aimed at coordinating schedules and operating standards, became increasingly concerned that if the United States government adopted a standard time scheme it would work to the disadvantage of its member railroads. William F. Allen, the secretary of the General Time Convention, argued that North American railroads should adopt a five zone standard, similar to the one in use today, to avoid government action. On October 11, 1883, the heads of the major railroads met in Chicago at the former Grand Pacific Hotel and agreed to adopt Allen’s proposed system. 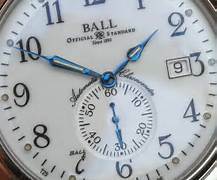 The members agreed that on Sunday, November 18, 1883, all United States and Canadian railroads would readjust their clocks and watches to reflect the new five zone system on a telegraph signal sent from the Allegheny Observatory in Pittsburgh at exactly noon on the 90th meridian. Although most railroads adopted the new system as scheduled, some did so early on October 7 and others late on December 2. The Intercolonial Railway serving the Canadian maritime provinces of New Brunswick and Nova Scotia just east of Maine decided not to adopt Intercolonial Time based on the 60th meridian west of Greenwich, instead adopting Eastern Time, so only four time zones were actually adopted by U.S./Canadian railroads in 1883. Major American observatories, including the Allegheny Observatory, the United States Naval Observatory, the Harvard College Observatory, and the Yale University Observatory, agreed to provided telegraphic time signals at noon Eastern Time. Standard time was not enacted into law until the 1918 Standard Time Act established standard time in time zones in U.S. law as well as daylight saving time (DST). The daylight savings time law was repealed in 1919 over a presidential veto, but reestablished nationally during World War II.